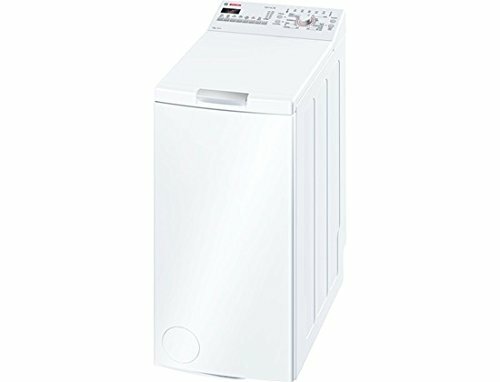 ​Top loader washing machines are really popular in America, Australia and Asia, but they're a rarity here in the UK. This is largely down to the use of space. In the UK, we tend to fit our machines under a bench; in other countries, a dedicated laundry room, a basement or even a balcony is more commonplace. Some Brits prefer them because they can offer faster cycle times, their design means you don't need to bend down (great if you've got a bad back) and you can add things into the wash mid-cycle. We took at look at the best top loaders on the market in 2019. Here are our top 5. ​Top loaders do the same job as font-loading machines, but there are some key differences you need to look out for. Capacity - As there is such a low demand on the UK market, the capacity tends to be around the standard 7kg. ​​Dimensions – ​Top loading machines are ​much more slimline and slightly taller than regular washers. ​Front loaders are usually around 60cm wide by 80 cm tall. Top loaders are usually around 40cm wide by 90cm tall. This means they can get into narrower gaps, but probably won't be able to go under a counter. You also need to leave some clearing distance for the top to open. ​Energy-Efficiency - Due to their design these appliances tend to be less energy-efficient that front loading machines. ​You can expect "A+" to be an average rating, where for front loaders it would be "A++". ​That's not to say there aren't any "A+++" models - we've included one on our list. Just that they are a bit more expensive. Spin Speed - The spin speed of top loaders is usually slower than front loaders. If you shop around, you can still find some that are 1200rpm, and this rivals quite a few "regular" washers. ​A slower speed doesn't necessarily ​affect washing performance, but it does mean clothes will be wetter after the cycle is complete. This results in more time and energy spent drying them. Noise - As a general rule, you can expect top loads to be slightly louder during regular spin - but there's not much in it! The best top loading washing machines should produce under 80db during high-spin and around 50db during regular spin. Washing Performance - You can expect the washing performance to be pretty similar. After all, millions of people use this style and have only used this style. One thing worth noting is that washing cycles can be faster with top loading machines. Here are our reviews of the best top loads on the UK market in 2019. No review of UK household appliances would be complete without Hotpoint, which has been one of the most popular ​brands for many decades. 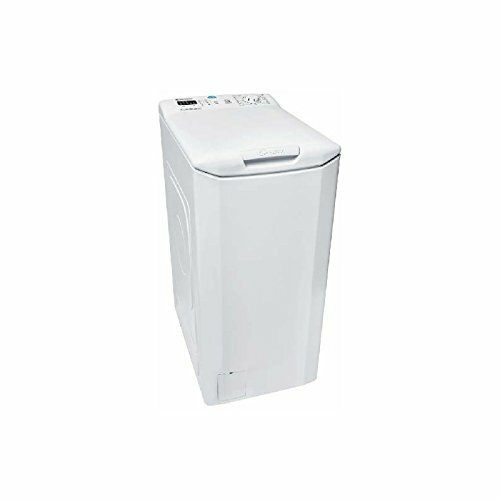 The Hotpoint WMTF 722H is a top-loader with a 7kg capacity. ​That’s enough for a smaller family or a couple, though a larger family may struggle. ​It comes with a massive 10-year parts and one-year labour warranty; that is, believe us, very impressive. What we particularity like about this one is it's easy to load and the d​igital controls are easy-to-use. With dimensions of 60cm by 40cm by 90cm, so it is slim and compact. Just be aware you do need to leave around a foot-and-a half clearance for the top to open. Here is a short video from Hotpoint to show you more. ​Another plus for this model is it's been awarded "A++" for energy-efficiency and only uses 9,600 litres of water a year. On the noise front, it puts out 76db at high-spin which is reasonably quiet. There's also a nice range of features, including the choice of three fast washes (15,30 and 60 minutes) and a wool program which keeps your delicates soft and gentle. 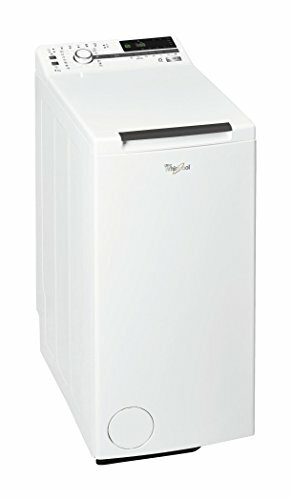 Overall, this is a solid choice for a freestanding washing machine and it's sensibly priced, too. Italian brand Candy is one of the most popular across Europe, and has a wide range of impressive appliances including this top-loading washing machine. ​This model has a 7kg capacity and a 1200 rpm. ​Standing 85cm tall, it's slightly shorter than a lot of freestanding designs which tend to be around 90cm. This might be important as you need to leave another 45 cm clearance to load your laundry. ​It has been awarded full-marks for energy-usage with a score of A+++. T​his translates into lower ​running costs using​ just 176 kw/h of electricity per year or an estimated £27. The Candy CST 372l-S comes with a standard 15 washing programmes. There is a 30-minute fast wash, special programs for jeans and mixed washes and also a delay timer (though you only have the choice of 3,6 or 9 hours in advance). The one real negative with this model is the noise. At high-spins it produces 78db which is on the low side of average. However, during regular spin it produces 61db which is pretty loud. I would expect the best washing machines to be in the 50db+ range (some are under). 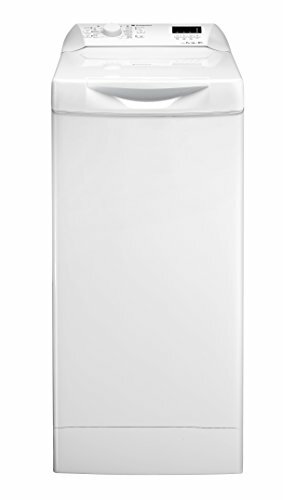 Still, if the noise isn't too much of an issue, this is a energy-efficient freestanding washer from a reputable brand. Another well-know brand offering top loading washing machines for the UK market is Whirlpool. And their T​DLR 70230 has a lot to like - regardless of the design. ​For starters, this washer is just 40 cm wide. That's perfect if you want to get it into a narrow space or a tall cupboard. It's also rated the maximum A+++ for energy efficiency, and is estimated to use just 174 kw / h per year (about £27). That makes it very similar to the Candy model we reviewed above - but this Zanussi performs much better in a few key areas. ​The first is it is much, much quieter. During regular spin it only produces 49db, which makes it the quietest on our list. A noise of 71 db during high spin is also reasonably quiet, too. Zanussi say this is a result of their "ZENtechnology" which uses a traction motor to cause less virbrations and noise. Top loaders due to their design usually leave a lot of water behind after the spin is finished. Not the Whirlpool TDLR 70230. It leaves just 44% - which quite frankly amazes me. This must be due to Whirlpool's "Sixth Sense" technology, which intelligently measures the size and type of loads and makes adjustments to the water and cycle time. Other features to admire include a 24-hour delay timer, a 30-minute quick-wash and a 2-years manufacturers guarantee. The only downside is is relatively pricey for a 7kg machine. You may well feel for some peace and quiet - it's worth it! Bosch is one of those brands that seems to have a product in every single area of the household appliances arena, and it is also a brand you can trust. ​As you would expect with German engineering, this freestanding washer is rated A+++​. It uses just 174kw / h - exactly the same as the Whirlpool model we reviewed above. ​It is quite louder during regular spin though at 59 db for low spin and 76db during fast spin. ​There are some nifty features like "ActiveWater", which intelligently weighs your load and makes adjustments to save water and energy. There's also an allergy-setting (the only model on our list to have this) which washes clothes at high-temperatures to kill more bacteria and allergens. And if you're the forgetful kind (or your kids are!) there is an "Add on" feature where you can stop the cycle and add in more clothes. There is an auto-lock feature to prevent opening during high-temperature parts of the wash as well. Other features include a variable spin speed, a 24-hour delay timer and a fast wash.
​Bosch provide a 2-year parts and services warranty with all there appliances, too. ​We round out our list with an older design given new life by modern technology. 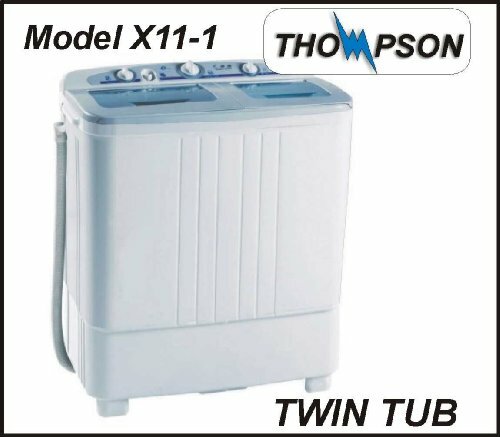 The Thompson Twin Tub is a top loading washing machine with an attached spin dryer​. ​​​If you haven't come across twin tubs before, you need to know they are not "automatic" washing machines. This means you don't need to plumb them in. You can just fill them from a tap with the hose that comes with it. ​At just 24kg, it's quite light when empty and can be moved to make things more convenient. A couple more things you do need to know about this particular model. First - the size. It's slightly shorter than the other freestanders on our list at 86cm, but the extra tub means it's almost twice the width at 75cm. ​It's capacity is 6kg, so that's a bit less than the standard 7kg on our list. However, users report they can get washing done and on the line in just 15 minutes, so it's quick if you need multiple loads. It also has a fast, 1400rpm spin speed, so will get your clothes dry enough to iron. On the down side, there is a lot of plastic with this design and this could put people off. ​Being a lesser-known brand, spares are harder to come buy. There is a 1-year guarantee included and you can contact the manufacturer direct on their website here. Still, one design than has the specs and programmes to rival any of it front-loading friends is the Whirlpool TDLR70230. We love it's energy-efficiency, great choice of programs and best of all - it's super-quiet!